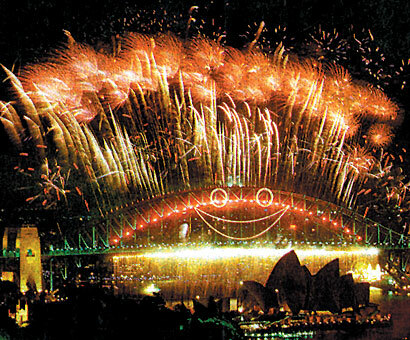 In 1996, following a public competition, Spectak was awarded the rights to create and produce the New Year's Eve celebration on behalf of the City of Sydney. This led to a happy smile breaking out on the Harbour Bridge as Spectak pioneered a bold new concept in entertainment that effectively turned the Harbour into one huge stage. Following this very successful event, Spectak was awarded a three year contract to produce Sydney's New Year's Eve celebrations - culminating in the Millennium spectacular. The three year program allowed the entertainment program to develop into one of the most ambitious and successful anywhere in the world. On the Millennium New Year's Eve, the Sydney celebrations were the first to be seen internationally and were judged by many television networks to be the best of the world's events. It was the biggest public event in Australian history, with 2 million spectators lining the Harbour on every vantage point and another 1 million revellers in the city itself to witness Spectak's program of entertainment that started at 4.00pm in the afternoon and ran through to the first dawn of the new century.